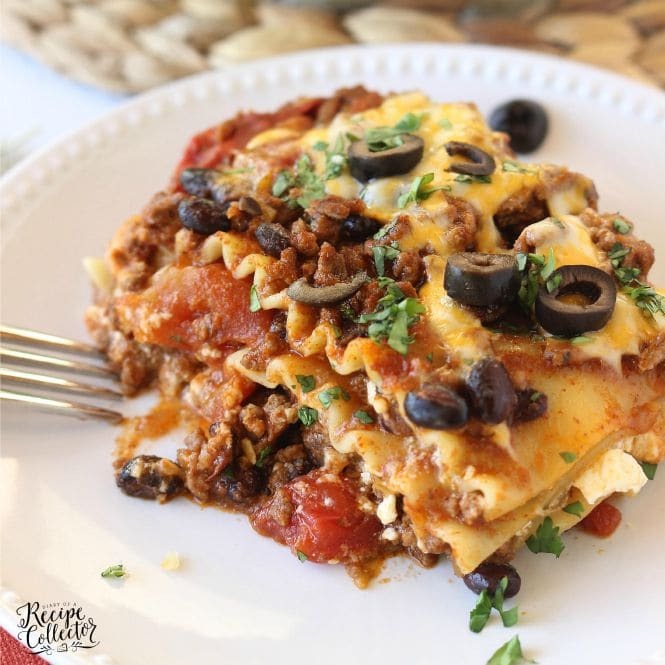 Mexican Lasagna – A hearty casserole filled with ground sirloin, three cheeses, lasagna noodles, tomatoes, and all those wonderful Mexican flavors. So today is our last day of summer vacation. I wish I could say we will spend it outside letting the kids play all day, but that would be a big NO. It is sweltering the last few weeks. Yesterday, we had a ton of errands to go run, and it was so hot, I had to come home and change into something cooler. You know it’s hot when I have that problem because I am normally so cold-natured. My husband picks on me all the time because I don’t like it to be below 75 outside because I get cold. I know…could I be more of a weenie? But seriously, the heat index this week is like 110 degrees. So there will not be much playing outside today unless it involves water. Here’s hoping no hurricanes head our way either. September is the peak season for them, so we always get a little nervous. 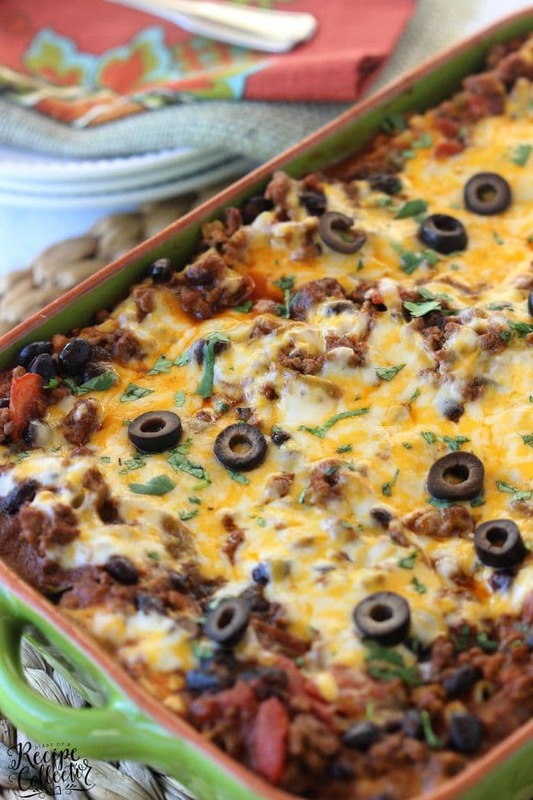 So as we wait this heat wave out and look forward to cooler casserole-making weather, I want to share this fabulous Mexican Lasagna with you all. It was delicious! It’s perfect for company too. Normally, I make casseroles and end up freezing the last few servings for busy nights during the school year. It works out perfectly. 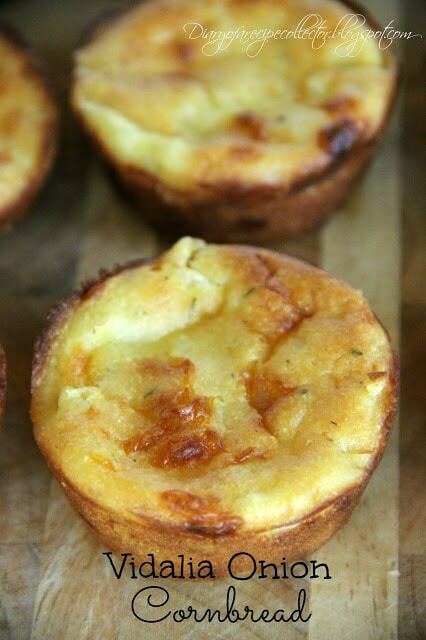 Serve it with a green salad and some of these great Vidalia Onion Cornbread Muffins. In a large pot, season ground sirloin with creole seasoning, chili powder, and cumin and brown. Add tomato sauce, diced tomatoes, black beans, green chiles, and water. Simmer over medium heat for about 10 minutes. Taste to season again. Turn off heat. Mix cottage cheese, 1 cup shredded cheese, 1 egg, salt and pepper, and cilantro in a bowl. Spray 9 x 13 casserole dish with cooking oil spray. Add 1½ cups sauce to bottom of casserole dish and spread out evenly. 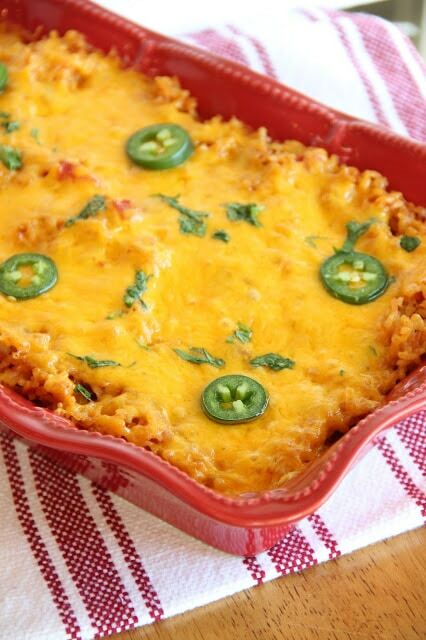 Repeat with 3 more noodles, meat sauce, last ½ of cottage cheese, and shredded cheese. Top with last 3 noodles, last ⅓ of meat sauce and more shredded cheese. Cover with foil sealing edges tightly. Bake at 350 for 50 minutes. Uncover and bake for 5 to 10 minutes more. *You may want to place casserole dish on a sheet pan in case any sauce bubbles over. Top with sliced olives and cilantro. Allow to cool about 10 minutes before cutting and serving. Looking for other great recipes? 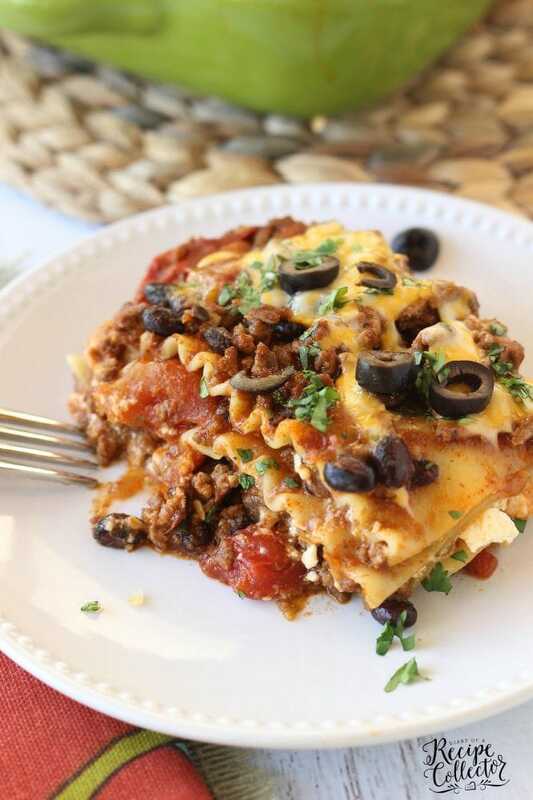 I LOVE comfort food and this lasagna looks incredible! 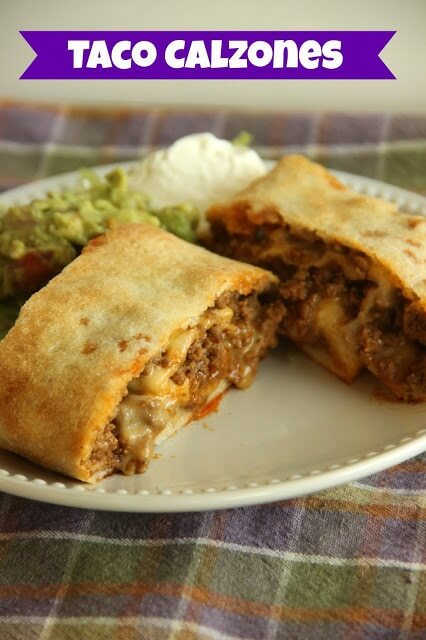 I love the Mexican twist and I know my hubby will too! Pinning and sharing! My husband laughs at me for being cold all the time too. I wish we would have had a few more hot days this summer for the kids to play at the pool, but now it’s school every day for them. 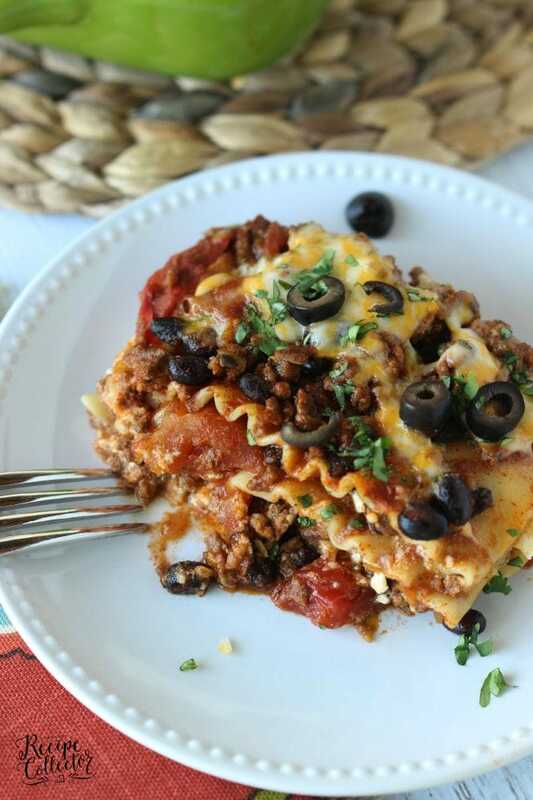 Love this fun lasagna. 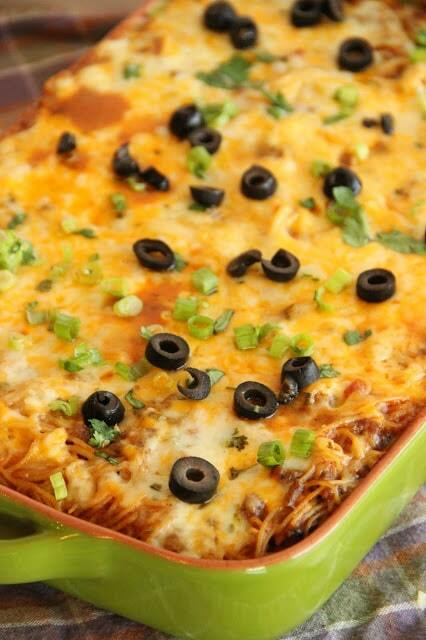 Our family loves Mexican so I know it would be devoured in a hurry!!! You had me at mexican food! Then you combine it with italian.. and gurl.. its a winner! YUM! Oh My! This looks amazing! We are huge Mexican Food Fans here. I am going to have to try this lasagna soon. Sharing Mexican food recipes makes me so happy and hungry. It’s like 1,000 degrees here also! This looks like a delight any day of the year! Very nice dish! Hello, comfort food! Love all of the olives on top! It has been so hot here too! I guess it is August, but I’m always surprised when it comes in, ha! This meal looks amazing! Awww thanks Amanda! I love that you made it! We love that one too! Miss you so much!! Thank you for this recipe!! I made this dish tonight and it was a huge hit! It truly is packed full of flavor and is extremely filling! I might make several batches next time to freeze them! That’s so awesome Alissa! So glad to hear y’all loved it! We usually freeze our leftovers in freezer bags. In fact, I just reheated one slice for my lunch this week! Thanks so much for letting me know! I made this for Cinco de Mayo! So good. I am thinking the leftovers will be even better. I dont like my food super spicy and this was not. If someone wants more heat some fresh jalepenos (sp?) would do the job. I also topped it off with mexican crema. Yummy! Hi Mary!! I’m so glad you liked it! Thanks for visiting! No I do not have that available on my site. However, I do have a little trick for you that you can use on any site. If you have a smartphone, you can get the My Fitness Pal app. It allows you to copy the link address on a recipe online and paste it or import it into the recipes portion of the app. It then calculates all the nutritional information for you! I’ve use it quite a few times on different recipes and love it! Hope this helps!